If you talk to people at WeWork, they'll tell you (it) isn't some mere arbitrageur of square footage; it's an interaction layer for maximizing productivity, or a creative community, or an operating system for the physical world. It's a technology company that happens to be sitting on a giant pile of real estate. As it evolves, all those long-term leases will become irrelevant. (The) company's valuation is that of a fast-growing software startup, not a real estate operator. Investors whose money constitutes the bulk of the Vision Fund (WeWork's largest investor) "told SoftBank executives they would prefer the fund stick to technology bets." There's a saying in football: If you have two quarterbacks, you have none. That is, if it's not obvious which of your players deserves the most important position on the team, you can be sure the options you're choosing between aren't all that great. Core business models are like quarterbacks. Sure, a sufficiently successful company will diversify over time through acquisitions or launches, but there should be no question about its true prime mover. Amazon wouldn't be in cloud services or smart-home hardware or supermarkets if it hadn't first mastered e-commerce. Facebook will always be a social media company, however many Oculus headsets or video chat tablets it sells. The company formerly known as WeWork is starting to resemble a head coach who announces during training camp that every player on his roster is capable of playing quarterback -- but also, he might just decide to take the field without a quarterback at all, because he's got some really next-level stuff on his whiteboard that's going to change the whole sport. Until the real games start, it's hard to say for sure that he's full of it, but the exaggerated nature of claim itself invites a certain amount of skepticism. As of this week, WeWork is known as the We Company, a moniker that better reflects its boundless ambitions, according to CEO Adam Neumann. Those ambitions include -- but are by no means limited to -- gyms, banks, and "giant wave pools for inland surfing." But for now, the We Company is divided into three primary units: WeLive, which operates short-term housing; WeGrow, which is starting for-profit elementary schools; and, of course, the business for which it's best known, WeWork, which leases cavernous commercial spaces and converts them into flexible offices and co-working suites for startups, remote teams, and other tenants. A few months ago, I talked to Shiva Rajaraman, WeWork's chief product officer. A veteran of YouTube, Spotify, and Apple, Rajaraman walked me through some of the ways WeWork sees itself creating value where no mere real estate operator ever has. 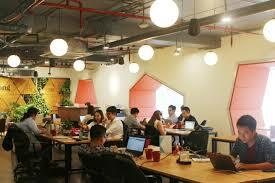 Through its member app, WeWork can match people with others nearby who possess skills or offer services they need. It can host events and activities that help remote teams feel like they're part of a bigger culture, improving morale and retention. Omnipresent sensors will allow for "continuous load balancing" of conference rooms and other facilities. WeWork's platform will understand and remember individuals' preferences so that, if a Chicago-based member checks into a WeWork in Berlin, her desk will automatically adjust to the correct height. "At the end of the day it's about collecting data that's not typically collected over time because usually people aren't at scale and aren't repeating it time and time again," Rajaraman told me. "If we can detect and understand the patterns in all that noise, they might be great levers to improve member experience and decrease our operating expense." That's a sizable if, but there's no question that the We Company is riding a deep current of technological transformation. Digital labor marketplaces like Fiverr and Upwork make it ever easier to outsource tasks to freelancers; new communications tools like Slack and Zoom make coordination across time zones seamless; other software platforms like Zendesk and Gusto make it easy to get a startup off the ground without much of a back office. All these trends make flexible work space for temporary, remote, or fast-growing teams a commodity that's only getting more valuable. So why is Neumann so anxious to be seen as offering something else? The obvious if probably too cynical answer is his company's valuation, which is very much that of a fast-growing software startup, not a real estate operator. IWG PLC, which owns the Regus brand of shared offices, had about twice as much revenue as WeWork last year, and it turned a profit, whereas WeWork lost $723 million in six months. But IWG's market capitalization is $2 billion, while the We Company's latest funding round pegs its valuation at $47 billion. That left SoftBank to invest its own money. While $47 billion is more than twice WeWork's previous valuation, in reality only about half of the $2 billion SoftBank is putting in prices it at that level. The other half will be used to buy shares from employees at an implied valuation of $20 billion. Which raises the question: If you have two valuations, do you really have none?